Seeing this amazing flavour combination makes me think you should play a game (with your daughter) that my baking friend in NYC plays with her baking friends. They pick a standard recipe - say, rice krispie treats, muffins or shortbread - and then come up with as many flavour combinations/add-ins as quickly as possible. Doesn't matter how weird. Just anything they like. Extreme recipe-ing. They scribble the ideas madly on paper and then pick the best ones to try. FUN, right? That does sound like fun, Movita! Maybe we should try it long distance by blog comments! Then everyone bakes the result. Perhaps a new challenge for your readers? I'm in! Actually, Muffin Monday started out that way, with Anuradha from Baker Street giving us a recipe that we had to adapt and make our own. It was always fun to see what folks came up with. Lately we are down to just the two of us baking so we've been choosing an ingredient together and then coming up with each our own recipes. I rather enjoyed the challenge the first way but this way gives me more freedom to create. *rubs hands together* Queue evil laugh track. These look spectacular! What a great combo! This look wonderful! Love goat cheese. Absolutely. Must. Try. This. Looks AMAZING! I have been enjoying fresh thyme from my garden, but mostly in savory applications! 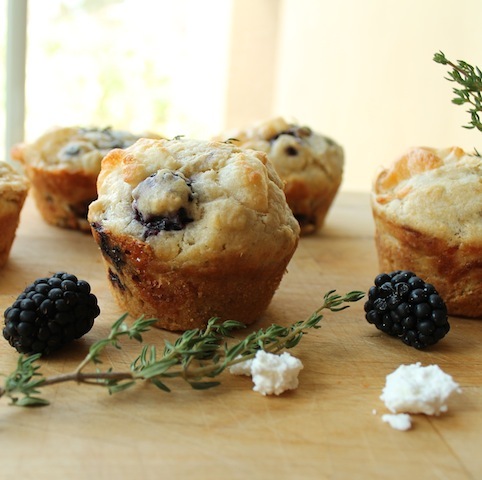 The vibrant Blackberry Chevre Muffins with Thyme are just lush with late summer delight! I hope you do try it, Bayta. Thank you! Thank you, Kathleen! Me too! Thanks, Marilyn! They were very tasty. What a wonderful relationship you have with your daughter, Stacy! You should feel proud that she's a strong, capable, competent, independent woman (just like her mom). I totally went through that stage where I wanted nothing to do with my parents. Gawd I was a pisser as a teenager. These muffins sounds incredible - like something you'd find in an uber gourmet bakery. What an amazing flavour combination! I want to use thyme more in my baking, it gives such an earthy, intense flavour. I think you were a typical teen and we should all be forgiven what trouble we got up to when we were young and stupid, don't you think? Goodness knows, I was a handful at times. I am proud to bursting of both my daughters, Nancy. They are beautiful young ladies, inside and out. Thank you for your kind words! These look delicious. Truly. I cannot believe the flavor combination. I bet these would be good with blueberries too. Pinning it! They would be good with blueberries too, Debra! In fact, like special salads, fruit is the perfect addition to most savory things. Thank you for pinning! Hey, who said I was ready?! I just know it's time. Deep sigh. But you are right. It is rewarding to know she can do it. As for the muffins, I think next time I will make them in the mini muffin tin and serve as appetizers. Then they would really be good for cocktail hour. I am looking forward to that when they get a little older, Kelli. I am already quite attached to my sisters' and friends' children so I know I'll feel even more strongly about grandbabies. I wrote a post quite a long while back about falling in love with the second daughter and falling in love with each new home. We just gotta open ourselves up! There's enough love there for sure. Sweet Tap Dancing Jesus! 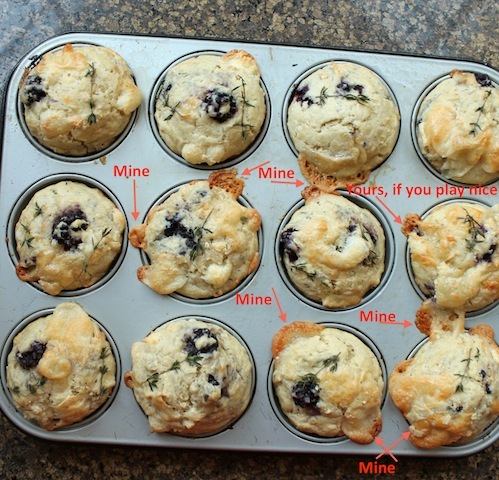 Thyme infused Muffins made my soul dance and I'm gonna try it ASAP! Thank you, Suborna! I've just gone over to visit your blog. You have a beautiful. eloquent way with words. Thank you, Laura. Blackberries are my new favorite sweet and savory ingredient. A couple of nights back, I made a tomato salad with them, mashing just a few into the vinaigrette first. Sublime! It sure was pretty too.